Hello! My name is Jennifer, and I’m a professional flutist in Spokane, Washington! I love playing flute in the Spokane Symphony and teaching private flute lessons and family music classes. I also enjoy planning trips, being insanely organized, creating abstract art, and writing free verse poetry. When I’m not playing with my wonderful colleagues, teaching my amazing students, or dancing and singing with my awesome Music Together families, I have lots of fun exploring the city and surrounding areas of the beautiful Inland Northwest. My wife Samantha and I like going on adventures with our dog, hiking the trails, playing at the dog park, snowshoeing on Mt. Spokane, cooking delicious food, reading books, watching TV, lounging on the deck, and hanging out with friends. Flutist Jennifer Slaughter is a sincere, engaging performer and educator dedicated to sharing music with communities of all shapes and sizes. 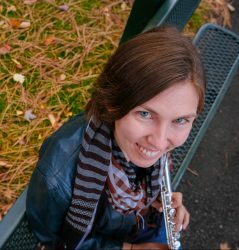 Jennifer has performed with many ensembles and is currently Third Flute with the Spokane Symphony. 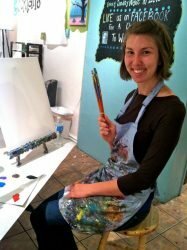 In the fall of 2011, she studied abroad for a semester in Vienna, Austria, where she took lessons in flute and Alexander Technique. Along with Alexander Technique, Jennifer has experience with the practice of iRest and performance psychology strategies, all of which continue to have a major influence on her performing and pedagogical ideas regarding whole body awareness. Jennifer has given several solo recitals and participated in many masterclasses and competitions. She has performed recitals and played live music—solo and chamber—throughout Spokane at various venues, including retirement communities, farmers markets, community music schools, and music galleries. She has also played in masterclasses for renowned flutists such as William Bennett, Mimi Stillman, Amy Porter, Angeleita Floyd, Jill Felber, Claudia Anderson, Marianne Gedigian, and Alison Brown-Sincoff. Jennifer was a winner in the 2014 National Flute Association’s Masterclass Competition as well as a winner in the 2015 Boise State University Concerto Competition, which allowed her to perform in front of the University Symphony Orchestra. Teaching is an integral part of Jennifer’s professional life. She has taught private flute lessons for over 12 years, and several of her students have been chosen for regional honor bands and All-State ensembles, accepted into youth symphonies, and made first chair. 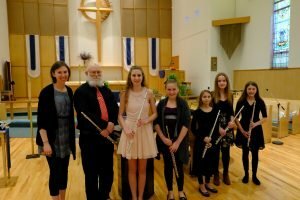 She has designed a curriculum and built a thriving private flute studio community in Spokane as well as taught piccolo/flute workshops, led flute sectionals, and organized All-State clinics throughout the country. Jennifer is also a registered Music Together family music instructor and teaches family music classes for parent/caregivers and their children, ages 0-5. Jennifer received her Master of Music degree in Flute Performance from Boise State University under Dr. Nicole Molumby, Associate Professor of Flute. She received a Bachelor of Music degree from the University of Denver’s Lamont School of Music in Denver, Colorado under Pamela Endsley, retired Professor of Flute and former Principal Flute of the Colorado Symphony Orchestra. Other instructors have included Jeffrey Barker, Barbara Gisler-Haase, and Sandra Moore Wacha.